The Chicano Movement of the 1960s, also called the Chicano civil rights movement or El Movimiento, was a civil rights movement extending the Mexican-American civil rights movement of the 1960s with the stated goal of achieving Mexican American empowerment. Similar to the Black Power movement, scholars have also written about the repression and police brutality experienced by members of this movement which some connect to larger government-organized activity such as COINTELPRO. The conflict between Chicanos and the LAPD thus helped Mexican Americans develop a new political consciousness that included a greater sense of ethnic solidarity, an acknowledgment of their subordinated status in American society, and a greater determination to act politically, and perhaps even violently, to end that subordination. While most people of Mexican descent still refused to call themselves Chicanos, many had come to adopt many of the principles intrinsic in the concept of chicanismo. Chicanos did this through the creation of works of literary and visual art that validated the Mexican American ethnicity and culture practices. The term Chicanos was originally used as a derogatory label for the sons and daughters of Mexican migrants. Some prefer to spell the word "Chicano" as "Xicano". This new generation of Mexican Americans were singled out by people on both sides of the border in whose view these Mexican Americans were not "American", yet they were not "Mexican", either. In the 1960s "Chicano" was accepted as a symbol of self-determination and ethnic pride. The Chicano Movement also addressed discrimination in public and private institutions. Early in the twentieth century, Mexican Americans formed organizations to protect themselves from discrimination. One of those organizations, the League of United Latin American Citizens, was formed in 1929 and remains active today. The Chicano Movement had been fermenting since the end of the U.S.–Mexican War in 1848, when the current U.S–Mexican border took form. Since that time, many Chicanos and Chicanas have campaigned against discrimination, racism and exploitation. The Chicano Movement that culminated in the early 1970s took inspiration from heroes and heroines from their indigenous, Mexican and American past. The movement gained momentum after World War II when groups such as the American G.I. Forum (AGIF), which was founded by returning Mexican American veteran Dr. Hector P. Garcia, joined in the efforts by other civil rights organizations. The AGIF first received national exposure when it took on the cause of Felix Longoria, a Mexican American serviceman who was denied a funeral service in his hometown of Three Rivers, Texas after being killed during WWII. After the Longoria incident, the AGIF quickly expanded throughout Texas and by the 1950s, chapters were founded across the U.S.
Mexican American civil rights activists also achieved several major legal victories including the 1947 Mendez v. Westminster court case ruling which declared that segregating children of "Mexican and Latin descent" was unconstitutional and the 1954 Hernandez v. Texas ruling which declared that Mexican Americans and other historically-subordinated groups in the United States were entitled to equal protection under the 14th Amendment of the U.S. Constitution. There were several leaders throughout the Chicano Movement. In New Mexico there was Reies López Tijerina who worked on the land grant movement. He fought to regain control of what he considered ancestral lands. He became involved in civil rights causes within six years and also became a cosponsor of the Poor People's March on Washington in 1967. In Texas, war veteran Dr. Hector P. Garcia founded the American GI Forum and was later appointed to the United States Commission on Civil Rights. In Denver, Rodolfo "Corky" Gonzáles helped define the meaning of being a Chicano through his poem Yo Soy Joaquin (I am Joaquin). 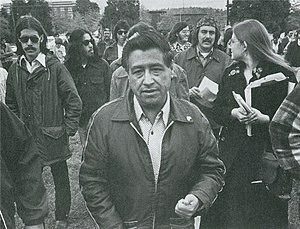 In California, César Chávez and the farm workers turned to the struggle of urban youth, and created political awareness and participated in La Raza Unida Party. The most prominent civil rights organization in the Mexican-American community is the Mexican American Legal Defense and Educational Fund (MALDEF), founded in 1968. Although modeled after the NAACP Legal Defense and Educational Fund, MALDEF has also taken on many of the functions of other organizations, including political advocacy and training of local leaders. Some women who worked for the Chicano movement felt that members were being too concerned with social issues that affected the Chicano community, instead of addressing problems that affected Chicana women specifically. This led Chicana women to form the Comisión Femenil Mexicana Nacional. In 1975, it became involved in the case Madrigal v. Quilligan, obtaining a moratorium on the compulsory sterilization of women and adoption of bilingual consent forms. These steps were necessary because many Hispanic women who did not understand English well were being sterilized in the United States at the time, without proper consent. With the widespread immigration marches which flourished throughout the U.S. in the Spring of 2006, the Chicano Movement has continued to expand in its focus and the number of people who are actively involved within the Mexican American community. As of the 21st Century, a major focus of the Chicano Movement has been to increase the (intelligent) representation of Chicanos in mainstream American media and entertainment.There are also many community education projects to educate Latinos about their voice and power like South Texas Voter Registration Project. SVREP's mission is to empower Latinos and other minorities by increasing their participation in the American democratic process. Members of the beginning of the Chicano movement like Faustino Erebia Jr., still speak about their trials and the changes they have seen over the years. The movement started small in Colorado yet spread across the states becoming a worldwide movement for equality. While there are many poets who helped carry out the movement, Corky Gonzales was able to spread the Chicano issues worldwide through "The Plan Espiritual de Aztlán." This manifesto advocated Chicano nationalism and self-determination for Mexican Americans. In March 1969 it was adopted by the First National Chicano Liberation Youth Conference based in Colorado. Adolfo Ortega says, "In its core as well as its fringes, the Chicano Movement verged on strivings for economic, social, and political equality." This was a simple message that any ordinary person could relate to and want to strive for in their daily lives. Whether someone was talented or not they wanted to help spread the political message in their own way. 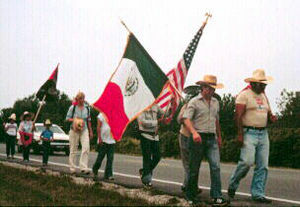 While majority of the group consisted of Mexican-Americans many people of other nationalities wanted to help the movement. This helped moved the movement from the fringes into the more mainstream political establishment. The "Political Establishment" typically consisted of the dominant group or elite that holds power or authority in a nation. Many successful organizations were formed such as the Mexican American Youth Organization(MAYO). MAYO was established to fight for Civil rights of Mexican Americans. During the early 1960s in Texas many Mexican-Americans were treated like second class citizens and discriminated against. While progress has been made for equality immigrants even to this day are still a target of misunderstanding and fear. Chicano Poetry was a safe way for political messages to spread without fear of being targeted for by speaking out. Politically, the movement was also broken off into sections like chicanismo. "Chicanismo meant to some Chicanos dignity, self respect, pride, uniqueness, and a feeling of a cultural rebirth." Mexican-Americans wanted to embrace the color of their skin instead of it being something to be ashamed of. Many Mexican-Americans unfortunately had it ingrained on them through society that it was better socially and economically to act "White" or "Normal." The movement wanted to break that mindset and embrace who they were and be loud and proud of it. A lot of people in the movement thought it was acceptable to speak Spanish to one another and not be ashamed of not being fluent in English. The movement encouraged to not only discus tradition with other Mexican-Americans but others not within the movement. America was a land of immigrants not just for the social and economically accepted people. The movement made it a point not to exclude others of other cultures but to bring them into the fold to make everyone understanding of one another. While America was new for many people of Latin descent it was important to celebrate what made them who they were as a culture. Entertainment was powerful tool to spread their political message inside and out of their social circles in America. Chicanismo might not be discussed frequently in the mainstream media but the main points of the movement are: self-respect, pride, and cultural rebirth. This is a list of the major epicenters of the Chicano Movement. While Chicanas are typically not covered as heavily in literature about the Chicano movement, contemporary literature written by Chicana feminists have begun to re-write the history of women in the movement. Chicanas who were actively involved within the movement have come to realize that their intersecting identities of being both Chicanas and women were more complex than their male counterparts. Through the involvement of various movements, the main goal of these Chicanas was to include their intersecting identities within these movements, specifically choosing to add women issues, racial issues, and LGBTQ issues within movements that ignored such identities. Sociologist Teresa Cordova, when discussing Chicana feminism, has stated that Chicanas change the discourse of the Chicano movement that disregard them as well as oppose the hegemonic feminism that neglects race and class. Through the Chicano movement, Chicanas felt that the movement was not addressing certain issues that women faced under a patriarchal society, specifically addressing material conditions. Within the feminist discourse, Chicanas wanted to bring awareness to the forced sterilization many Mexican women faced within the 1960s. The film No Mas Bebes describes the stories of many these women who were sterilized without consent. Although Chicanas have contributed significantly to the movement, Chicana feminist have been targeted for betrayal to the Chicano movement overall as well as seen as anti-family and anti-man. By creating a platform that was inclusive to various intersectional identities, Chicana theorists who identifies as lesbian and heterosexual were in solidarity of both. With their navigation through patriarchal structures Chicana feminist, through their intersecting identities, added to the Chicano discourse: political economy, imperialism, and class relations. Enriqueta Longeaux and Vasquez discussed in the Third World Women's Conference, "There is a need for world unity of all peoples suffering exploitation and colonial oppression here in the U.S., the most wealthy, powerful, expansionist country in the world, to identify ourselves as third world peoples in order to end this economic and political expansion." Scholars have paid some attention to the geography of the movement, and situate the Southwest as the epicenter of the struggle. However, in examining the struggle's activism, maps allow us to see that activity was not spread evenly through the region and that certain organizations and types of activism were limited to particular geographies. For instance, in southern Texas where Mexican Americans comprised a significant portion of the population and had a history of electoral participation, the Raza Unida Party started in 1970 by Jose Angel Gutierrez hoped to win elections and mobilize the voting power of Chicanos. RUP thus became the focus of considerable Chicano activism in Texas in the early 1970s. The movement in California took a different shape, less concerned about elections. Chicanos in Los Angeles formed alliances with other oppressed people who identified with the Third World Left and were committed to toppling U.S. imperialism and fighting racism. The Brown Berets, with links to the Black Panther Party, was one manifestation of the multiracial context in Los Angeles. The Chicano Moratorium antiwar protests of 1970 and 1971 also reflected the vibrant collaboration between African Americans, Japanese Americans, American Indians, and white antiwar activists that had developed in Southern California. Chicano student activism also followed particular geographies. MEChA established in Santa Barbara, California in 1969, united many university and college Mexican American groups under one umbrella organization. MEChA became a multi-state organization, but an examination of the year-by-year expansion shows a continued concentration in California. The Mapping American Social Movements digital project show maps and charts demonstrating that as the organization added dozens then hundreds of chapters, the vast majority were in California, which should lead scholars to ask what conditions made the state unique, and to wonder why Chicano students in other states were less interested in organizing MEChA chapters. In 1949 and 1950, the American G.I. Forum initiated local "pay your poll tax" drives to register Mexican American voters. Although they were unable to repeal the poll tax, their efforts did bring in new Hispanic voters who would begin to elect Latino representatives to the Texas House of Representatives and to Congress during the late 1950s and early 1960s. In California, a similar phenomenon took place. When World War II veteran Edward R. Roybal ran for a seat on the Los Angeles City Council, community activists established the Community Service Organization (CSO). The CSO was effective in registering 15,000 new voters in Latino neighborhoods. With this newfound support, Roybal was able to win the 1949 election race against the incumbent councilman and become the first Mexican American since 1886 to win a seat on the Los Angeles City Council. The Mexican American Political Association (MAPA), founded in Fresno, California came into being in 1959 and drew up a plan for direct electoral politics. MAPA soon became the primary political voice for the Mexican-American community of California. After World War II, Chicanos began to assert their own views of their own history and status as Mexican Americans in the US and they began to critically analyze what they were being taught in public schools. In the late 1960s, when the student movement was active around the globe, the Chicano Movement inspired its own organized protests like the mass walkouts of high school students and the Chicano Moratorium in Los Angeles in 1970. The student walkouts occurred in Denver and East LA of 1968. There were also many incidents of walkouts outside of the city of Los Angeles. In the LA County high schools of El Monte, Alhambra, and Covina (particularly Northview) the students marched to fight for their rights. Similar walkouts took place in 1978 of Houston high schools to protest the discrepant academic quality for Latino students. There were also several student sit-ins as objection to the decreasing funding of Chicano courses. The blowouts of the 1960s can be compared to the 2006 walkouts, which were done as opposition to the Illegal Immigration Control bill. Chicano student groups such as United Mexican American Students (UMAS), Mexican American Youth Association (MAYA) in California, and the Mexican American Youth Organization (MAYO) in Texas, developed in universities and colleges in the mid-1960s. South Texas had a local chapter of MAYO that also made significant changes to the racial tension in this area at the time. Members included Faustino Erebia Jr, local politician and activist, who has been a keynote speaker at Texas A&M University at the annual Cesar Chavez walk. At the historic meeting at the University of California, Santa Barbara in April 1969, the diverse student organizations came together under the new name Movimiento Estudiantil Chicano de Aztlán (MECHA). Between 1969 and 1971, MECHA grew rapidly in California with major centers of activism on campuses in southern California, and few chapters were created along the East coast at Ivy LeagueSchools. And by 2012, MECHA had more than 500 chapters throughout the U.S. Student groups such as these were initially concerned with education issues, but their activities evolved to participation in political campaigns and to various forms of protest against broader issues such as police brutality and the U.S. war in Southeast Asia. The Brown Berets, a youth group which began in California, took on a more militant and nationalistic ideology. Edward J. Escobar details in his work the relationship between various movements and demonstrations within the Chicano Movement and the Los Angeles Police Department between the years 1968-1971. His main argument explores how "police violence, rather than subduing Chicano movement activism, propelled that activism to a new level -- a level that created a greater police problem than had originally existed" (1486). At one Chicano Moratorium (also referred to as the National Chicano Moratorium) demonstration as part of the Anti-war activism, popular journalist Ruben Salazar was killed by police after they shot a tear-gas projectile into the Silver Dollar Café where he was after covering the moratorium demonstration and succeeding riots. This is an example Escobar presents that inspired political consciousness in an even broader base of Mexican-Americans, many considering him a "martyr" (1485). Relations between Chicano activists and the police mirrored those with other movements during this time. As Escobar states, Black Civil Rights activists in the 50s and 60s "set the stage by focusing public attention on the issue of racial discrimination and legitimizing public protest as a way to combat discrimination" (1486). Marginalized communities began using this public platform to speak against injustices they had been experiencing for centuries at the hands of the U.S. government, perpetuated by police departments and other institutions of power. Like many of the movements during this time, Chicanos took inspiration from the Black Panther Party and used their race, historically manipulated to disenfranchise them, as a source of cultural nationalism and pride. The Chicano Movement and its sub-organizations were infiltrated by local law enforcement and the Federal Bureau of Investigation (FBI) to acquire information and cause destabilization from within the organizations. Methods used by law enforcement included "red-baiting, harassment and arrest of activists, infiltration and disruption of movement organizations, and violence" (1487). Agent provocateurs were oftentimes planted in these organizations to disrupt and destabilize the movements from within. Repression from law enforcement broadened Chicano political consciousness, their identities in relation to the larger society, and encouraged them to focus their efforts in politics. Art of the Movement was the burgeoning of Chicano art fueled by heightened political activism and energized cultural pride. Chicano visual art, music, literature, dance, theater and other forms of expression have flourished. During the 20th century, an emergence of Chicano expression developed into a full-scale Chicano Art Movement. Chicanos developed a wealth of cultural expression through such media as painting, drawing, sculpture and printmaking. Similarly, novels, poetry, short stories, essays and plays have flowed from the pens of contemporary Chicano writers. Chicano Art developed around the 1960s. In its beginning stages, Chicano art was distinguished by the expression through public art forms. Chicano artists created a bi-cultural style that included US and Mexican influences. The Mexican style can be found by their use of bright colors and expressionism. The art has a very powerful regionalist factor that influences its work. Examples of Chicano muralism can be found in California at the historic Estrada Courts Housing Projects in Boyle Heights. Another example is La Marcha Por La Humanidad, which is housed at the University of Houston. About 20 years later, u Chicano artists were affected by political priorities and societal values. They were also becoming more accepted by society. They were becoming more interested making pieces for the museums and such, which brought about new forms of artwork, like easel paintings. By the late 1970s, women became very prominent in the artistic world. An increase in individualism was more apparent as Chicano artists entered the art business market. The Chicano press was an important component of the Chicano Movement to disseminate Chicano history, literature, and current news. The press created a link between the core and the periphery to create a national Chicano identity and community. The Chicano Press Association (CPA) created in 1969 was significant to the development of this national ethos. The CPA argued that an active press was foundational to the liberation of Chicano people, and represented about twenty newspapers, mostly in California but also throughout the Southwest. Chicanos at many colleges campuses also created their own student newspapers but many ceased publication within a year or two, or merged with other larger publications. Organizations such as the Brown Berets and MECHA also established their own independent newspapers. And Chicano communities published newspapers like El Grito del Norte from Denver and Caracol from San Antonio. Over 300 newspapers and periodicals in both large and small communities have been linked the Movement. The concept of Aztlán as the place of origin of the pre-Columbian Mexican civilization has become a symbol for various Mexican nationalist and indigenous movements. The name Aztlán was first taken up by a group of Chicano independence activists led by Oscar Zeta Acosta during the Chicano movement of the 1960s and 1970s. They used the name "Aztlán" to refer to the lands of Northern Mexico that were annexed by the United States as a result of the Mexican–American War. Combined with the claim of some historical linguists and anthropologists that the original homeland of the Aztecan peoples was located in the southwestern United States even though these lands were historically the homeland of many American Indian tribes (e.g. Navajo, Hopi, Apache, Comanche, Shoshone, Mojave, Zuni and many others). Aztlán in this sense became a "symbol" for mestizo activists who believed they have a legal and primordial right to the land, although this is disputed by many of the American Indian tribes currently living on the lands they claim as their historical homeland. Some scholars argue that Aztlan was located within Mexico proper. Groups who have used the name "Aztlán" in this manner include Plan Espiritual de Aztlán, MEChA (Movimiento Estudiantil Chicano de Aztlán, "Chicano Student Movement of Aztlán"). Many in the Chicano Movement attribute poet Alurista for popularizing the term Aztlán in a poem presented during the Chicano Youth Liberation Conference in Denver, Colorado, March 1969. ^ a b c d e f Escobar, Edward J. (March 1993). "The Dialectics of Repression: The Los Angeles Police Department and the Chicano Movement, 1968-1971". The Journal of American History. 79: 1483–1514. doi:10.2307/2080213. JSTOR 2080213. ^ "LULAC: LULAC History - All for One and One for All". Retrieved 23 September 2015. ^ "Found in the Garcia Archives: Inspiration from a Notable Civil Rights Leader". HistoryAssociates.com. Retrieved 31 January 2018. ^ Williams, Rudi. "Congress Lauds American G.I. Forum Founder Garcia". U.S. Department of Defense. Archived from the original on 2012-04-14. ^ "American GI Forum Map". Mapping American Social Movements. Retrieved 2017-01-27. ^ "LatinoLA - Hollywood :: Mendez v. Westminster". LatinoLA. Retrieved 23 September 2015. ^ "HERNANDEZ v. TEXAS. The Oyez Project at IIT Chicago-Kent College of Law". Oyez.org. Retrieved 9 April 2018. ^ "STERILIZED in the Name of Public Health". PubMed Central (PMC). Retrieved 23 September 2015. ^ "Untitled Document". Retrieved 23 September 2015. ^ Ordóñez, Elizabeth (Summer 2006). "Sexual Politics and the Theme of Sexuality in Chicana Poetry". Letras Femeninas. 32: 67–92. ^ a b c d e Hurtado, Aída (1998). "Sitios y Lenguas: Chicanas Theorize Feminisms". Hypatia. 13 (2): 134–161. doi:10.1111/j.1527-2001.1998.tb01230.x. JSTOR 3810642. ^ Mariscal, Jorge (2002). "Left turns in the Chicano Movement: 1965-1975". Monthly Review. 54 (3): 59–68. doi:10.14452/mr-054-03-2002-07_6. ^ "Chicano/Latino Movements History and Geography". Mapping American Social Movements Through the 20th Century. ^ ""Our First Poll Tax Drive": The American G.I. Forum Fights Disenfranchisement of Mexican Americans in Texas". Retrieved 23 September 2015. ^ "Election of Roybal, democracy at work : extension of remarks of Hon. Chet Holifield of California in the House of Representatives". Retrieved 23 September 2015. ^ "The South Texan Texas A&M University-Kingsville" (PDF). Tamuk.edu. March 23, 2010. Retrieved 9 April 2018. ^ "MEChA chapters map". Mapping American Social Movements. Retrieved 2017-01-27. ^ "30 Years After the Chicano Moratorium". Frontlines of Revolutionary Struggle. Retrieved 23 September 2015. ^ a b T.,, García, Mario. The Chicano generation: testimonies of the movement. Oakland, California. ISBN 9780520286023. OCLC 904133300. ^ Goldman, Shifra M. "Latin American artists of the USA". Oxford Art Online. Retrieved 20 April 2012. ^ "Estrada Courts". Laconservancy.org. Retrieved 9 April 2018. ^ "Chicano/Latino Movements History and Geography". Mapping American Social Movements. ^ "Chicano Newspapers and Periodicals, 1966-1979". Mapping American Social Movements. ^ "Alurista Essay - Critical Essays". eNotes. Retrieved 23 September 2015. Sánchez, George I (2006). "Ideology, and Whiteness in the Making of the Mexican American Civil Rights Movement, 1930–1960". Journal of Southern History. 72 (3): 569–604. JSTOR 27649149. "La Batalla Está Aquí": The Chicana/o Movement in Los Angeles, interview series, Center for Oral History Research, UCLA Library Special Collections, University of California, Los Angeles. Chicano Newspapers and Periodicals 1969-1979 A map of Chicano press across the country from 1969 to 1970 based on serial listings collected by the University of California Libraries.